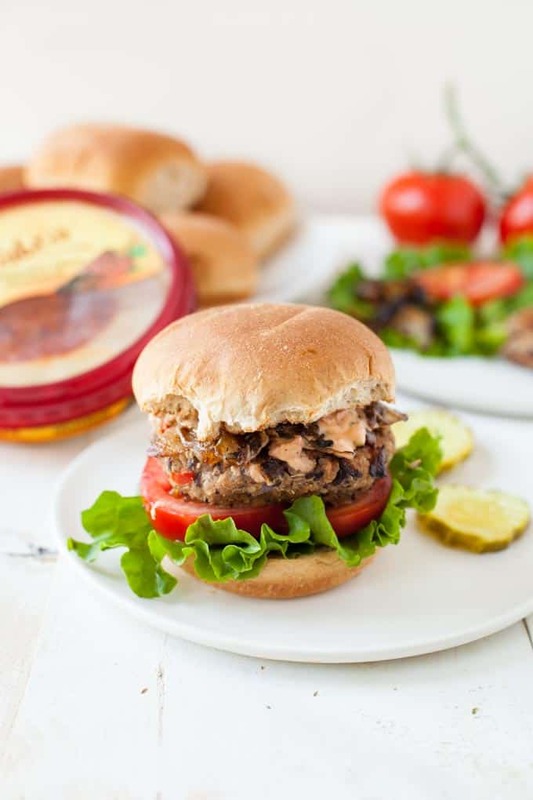 A veggie burger that packs in a lot of flavor and nutrition, this spicy hummus black bean veggie burger is perfect for summertime grilling. This post is sponsored by Sabra Hummus. Thanks for supporting the brands that make TFD possible. Of course, all opinions are my own! We are hummus fiends at The Foodie Dietitian household. We easily go through 2 containers per week…at least. Paired with some baby carrots, bell pepper slices or rice chips, it is our go-to afternoon snack. And we tend to rotate flavors so we never get bored…roasted red pepper, chipotle, sun-dried tomato, spicy, etc. Hummus is a spread with Middle Eastern origin that’s made from chickpeas, tahini (sesame seed paste) and oil. Depending on the desired taste, you can add garlic, spices and herbs to enhance the flavor. DYK that nine out of ten Americans don’t meet the recommended daily servings for vegetables?! For people who struggle to get enough vegetables on their plates, hummus can be a hero. Beans are considered part of both the vegetable and protein groups and the Dietary Guidelines recommend 1 1/2 cups of beans per week as part of a healthy diet. Two heaping spoonfuls of hummus (or 2 ounces) count as 1/4 serving of beans so if you consume 2 spoons of hummus daily you’ll be well on your way to meeting the recommended bean amounts for the week! Not only does hummus help get you closer to meeting your bean and veggie intake, but it also provides a nutrient boost. Chickpeas are a source of fiber, iron, B vitamins and plant-based protein and tahini provides healthy mono- and polyunsaturated fats. Use hummus in place of cream or yogurt in a soup, like my Spicy Creamy Sweet Potato Hummus Soup. Use hummus in place of mayo in tuna or chickpea salad and as a spread for sandwiches. Spread hummus on bagels instead of cream cheese. Use hummus instead of sour cream or butter in your mashed or baked potatoes. Try hummus instead of mayo or yogurt to make a creamy salad dressing. Hummus makes for a great binder for homemade veggie burgers. 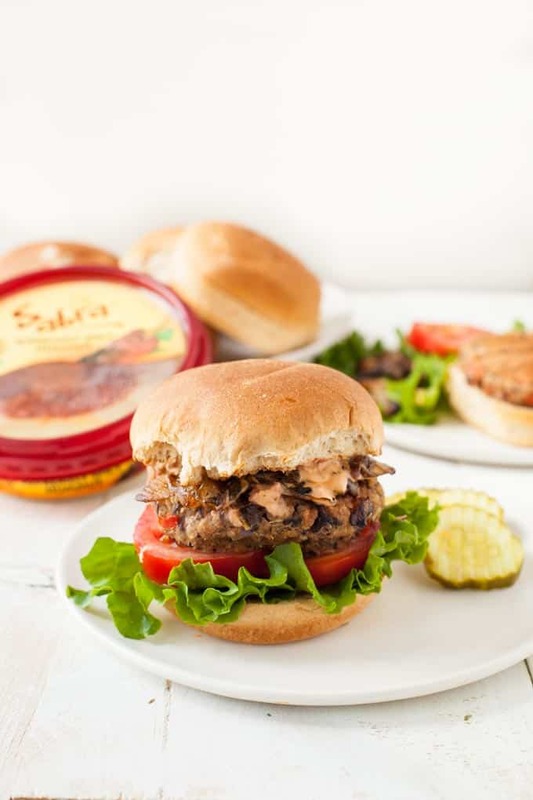 Speaking of veggie burgers, I have a deliciously spicy veggie burger recipe for ya’ll today using Sabra Hummus. I’m always on the lookout for new veggie burger recipes in the summertime when we start firing up the grill. Usually, we have this buffalo chickpea quinoa burger on repeat during the summer but we needed a change. 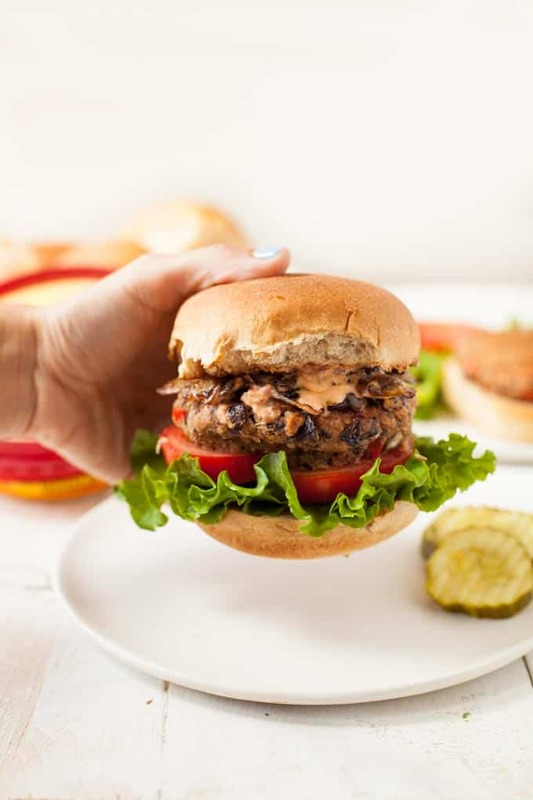 Steve declared this Spicy Hummus Black Bean Burger as his official new favorite veggie burger recipe. 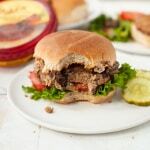 I love this recipe because it’s packed with a lot of spicy flavor and the hummus helps hold the patty together. The burgers are moist, meaty and satisfying. And that chipotle special sauce adds another layer of heat. Top the burgers with caramelized onions for a little sweet reprieve to balance out the spice. In a food processor, pulse bell pepper until finely chopped. Add beans and pulse until thick and pasty. Place bean mixture into a large mixing bowl and stir in shallot, quinoa, hummus, quinoa flakes chipotle powder and salt until mixture is sticky and holds together. Form mixture into eight patties and refrigerate for 30 minutes, uncovered. Meanwhile, preheat grill to medium-low; clean and lightly oil grill and make the Chipotle Special Sauce. Place burger on a toasted hamburger bun. Spread chipotle special sauce on the bun and layer on desired toppings like caramelized onion, lettuce, tomato and pickles. Using a food processor or immersion blender, blend the Greek yogurt, chipotle pepper, ketchup and olive oil to a puree. Salt to taste. Spread on hamburger buns. *Not a fan of spicy? Swap Sabra Supremely Spicy Hummus for Roasted Red Pepper and use 1/2 tablespoon chipotle in the special sauce. **You can also use an indoor grill pan or fry pan and cook for about 3-4 minutes on each side. ***For a vegan friendly sauce, swap Greek yogurt with vegan mayo. Tell me, have you ever tried using hummus in a veggie burger? What’s your favorite hummus swap? what a beautiful delish recipe and the food pics make my mouth water! You scored a home run with this recipe Kara..can’t wait to try it! Thanks, Chere!! Hope you enjoy! PS, I have never used or seen quinoa flakes!! They’re usually placed near oatmeal in the grocery store aisle. Great for veg burg making and you can use as an oatmeal substitute. Awesome! Hope you and your vegan friend enjoy it! So good, right, Christina?! Glad you enjoy it too! I LOVE veggie burgers, especially with black beans! This looks amazing! Thanks, Laura!! Can’t get enough of homemade veggie burgs in the summertime. We love hummus at my house too. This burger sounds amazing! Pinned it to make later. Thanks, Brynn! Hope you enjoy them! Thanks, Hannah! Makes them moist and delicious!